The Lake Mission Viejo, a man made lake that has been one of Mission Viejo's focal points, is surrounded primarily by private residential (single-family homes and condos) communities often known as the Mission Viejo Lake Homes or 'Lake Area' neighborhoods, with the Lake Mission Viejo Condos for Sale always in high demand due to the views many of the units have, and nice amenities that come with being right on the lake. The condominium communities of Mallorcas and Finisterras on the Lake have their own private beach and clubhouse. There's also the communities of Andalusia and Madrid del Lago that are lake close and considered "Lake Area" neighborhoods, some homes here will boast beautiful lake views. Tres Vistas and San Marino Estates are guard gated luxury waterfront homes with their own dock and private beach. Tres Vistas, San Marino, Finisterra on the Lake and Mallorca condos are the only ones that will have some lakefront properties. Read more about the Lake Mission Viejo Real Estate. 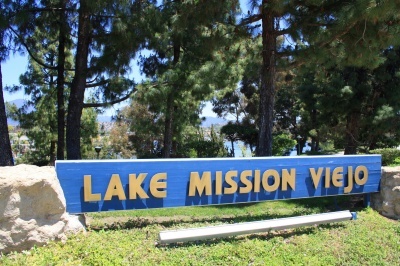 Below you'll find all available Lake Mission Viejo Condos for Sale. For more information about any of these homes, contact us. Read more about the Lake Mission Viejo Real Estate and its communities, homes and condos. Rare Opportunity….Enjoy the ambiance of an unobstructed view with lakefront living at its finest! A special location on a cul-de-sac with extra guest parking just steps from lake access, private boat docks and the lower pool/spa area. One of the few homes without docks directly in front of it, your panoramic view includes an end-to-end lake experience, East Beach, North Beach, the Oak Preserve, sunrises and majestic Saddleback Mountain views. Attractively priced, this designer, lakefront penthouse features one of the blue water best views on Lake Mission Viejo. Beautifully appointed and fully remodeled open concept with custom features and finishes, this two bedroom, two bath home features an entertainer’s dream kitchen, soaring vaulted ceilings, a master bedroom with a water view, walk-in closet, refrigerator, washer/dryer, LED lights all throughout, one car garage and one carport. Enjoy resort style living at the private guard gated lakeside Community of Mallorca in Mission Viejo. This premium end-unit condo with its large open and airy floor plan also includes a parkable driveway. Other features include a private courtyard, wood laminate flooring, recessed lighting, and a relaxing balcony just off the living room. Come enjoy all of what this special community has to offer with lake activities, pool, spa and BBQ area. The Lake Mission Viejo Real Estate options is bordered by four different lakefront neighborhoods, with luxury homes and condos. Tres Vistas Homes, San Marino Estates, Mallorca Condos and Finisterra by the Lake Condos. Tres Vistas and San Marino are custom homes and Finisterra on the Lake and Mallorca are condominiums and townhomes. Mallorca and Finisterra both offer a clubhouse and private beach. There are also several communities on the hills around the lake that feature dramatic views of the lake. Two of which, Canyon Crest and Vista del Lago are highly desired communities of Mission Viejo. Other Lake Mission Viejo real estate amenities include the 'Plaza del Lago', a shopping center with upscale shops, restaurants with lake views, and a fitness club. At Lake Mission Viejo, you can live amongst elegance surrounded by lake views while residing in one of Orange County's most desirable cities. If you would like further information or assistance regarding Mission Viejo Lake view Real Estate and available Mission Viejo Lake view homes for sale, please contact us.